The Bryan Ramp Therapeutic Night Guard™ is a major step forward in the treatment of chronic muscle tension from nocturnal clenching and grinding. You may be one of the 77 million Americans that unknowingly grind or clench their teeth at night. A condition called NOCTERNAL BRUXISM. The Bryan Ramp Therapeutic Night Guard™ is specifically designed to comfortably resolve these symptoms. The Bryan Ramp is often covered by dental insurance - CODE D9940. The Bryan Ramp Therapeutic Night Guard™ is very comfortable. It is made of FDA approved non allergenic materials that allow it to be thin yet strong. The Bryan Ramp will seat snugly on your upper teeth and not dislodge easily. The ramp on the front of the nightguard is custom made to allow only your lower six teeth to touch. As you bite into this ramp you may feel your lower jaw slightly extend forward. This position should feel comfortable and you will be able to slide in all directions smoothly without interference or touching your back teeth. It is the uniquely designed ramp that makes this nightguard therapeutic. The ramp is made for your individual jaw position and bite. It relieves the jaw from the compression of nighttime clenching and grinding and relaxes those muscles used in clenching and grinding because the back teeth don’t touch together. The back side of the Ramp is concave to provide more space and facilitate proper tongue position reducing snoring. 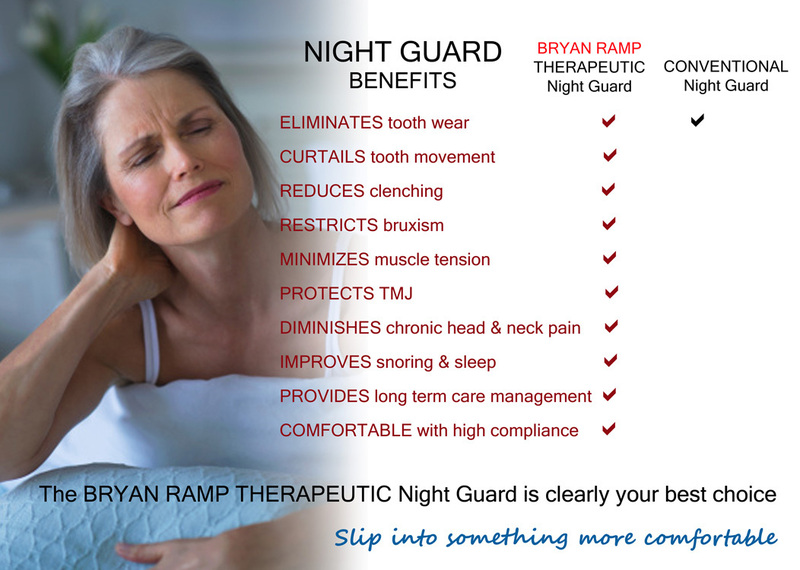 The Bryan Ramp therapeutic nightguard can only be fabricated and adjusted by your dentist. You should take the nightguard with you at every visit so your dentist can evaluate the fit and bite. The Bryan Ramp has a one year laboratory warranty, but it should give you many years of comfortable service. Remember to keep it safe from pets. It is recommended you wear the Bryan Ramp Therapeutic Night Guard™ whenever you sleep or even nap.